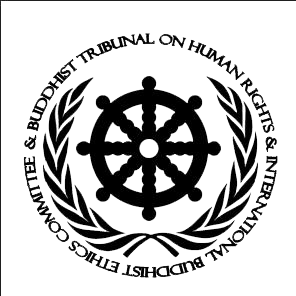 The World Association of Buddhism and the Buddhist Tribunal on Human Rights proclaim this UNIVERSAL DECLARATION OF HUMAN RIGHTS as the ideal or value to which all the peoples should aim, in order that both the individual and society be inspired, by promoting respect and the teaching of these freedoms and Spiritual Rights and by ensuring revolutionary actions for their effective implementation at international level. By being the unification of different ethical and spiritual traditions, the Maitriyana movement is committed to the creation and defence of a Universal Declaration of Spiritual Rights, so there is not only an ethical commitment with the human rights but also with the rights of animals and Earth. This implementation of the principles of the Middle Way is a commitment to the basic unity underlying all the differences between human beings, by recognizing the spiritual nature that is intrinsic to both humanity and the field of life. Therefore, the Buddhist Spirituality criticizes the inhuman treatment received by many peoples and many species of animals. Definitively, if the civilization continues attacking the world it will be nothing but a cancer that needs to be extirpated from the body of the Earth. Thus, the Maitriyana is a spiritual tradition that practices four metapolitical values: work for peace, fight for justice, support human rights and protect the planet. The Free and Enlightened Being confirms and transmits spiritual values in order that everyone increase their development of Liberty, Equality and Fraternity, recognizing the importance of true democracy and the rights of each being within the field of existence. Certainly, the interconnection and interdependence between every people shows that the spiritual values of unity and reconciliation are crucial for the survival and evolution of humanity and the Earth. Therefore, the Buddhist Spirituality is a movement working in pursuit of a global ethical order that reflects the spiritual values that have emerged in various world traditions. However, the Maitriyana affirms that such a global ethical order can only be built on the basis of a Universal Declaration of Spiritual Rights, establishing ethical principles and righteous rules that allow the peoples to act by compassionate wisdom. In addition, this global ethical order presented by the Buddhist Spirituality requires a criticism open to the metaphysical and materialistic movements that have governed society for thousands of years, by achieving a broad consensus on that the Cure of the major evils of the world must urgently be achieved. This common goal is the ethical framework that can properly unite the whole humanity under the same flag: the quest for the Liberation of all beings. In this sense, the Universal Declaration of Spiritual Rights driven by the Maitriyana develops the best aspects of all the ethical traditions of history, allowing the maximum of self-realization and self-transcendence of each person. Consequently, the Buddhist Spirituality teaches how to build a Pure Earth or Kingdom of Righteousness, by showing the Spiritual Rights and ethical responsibilities which every individual must have in order to live in dignity and to be able to build a better world. The Universal Declaration of Spiritual Rights is the very evolution of the concept of human rights, but simultaneously affirming and supporting the animal rights in conjunction with the ethical responsibility to protect and care for Mother Earth. Thus, the following fundamental premises are established as ethical lineament or cosmocentric commitment to the community and the entire world. 1. Every human being must respect his spiritual nature, which is Liberty, so that any institution or nation should protect this intrinsic dignity of humanity. 2. Every human being should try to avoid evil, do the good and purify the mind, assuming the principle of the intrinsic dignity with the practice of love the fellowbeing as oneself. 3. Every human being must act consciously, at the same time the communities and countries must encourage this essential skill, because it is the main distinction of humanity in relation to other living beings. 4. Every human being must contribute to the welfare of his community and the whole world, respecting the Truth and rights of everyone else. 5. Every human being must keep a relationship of love and harmony with other beings, ecosystems, the Earth and Cosmos, because one definitely interexists with the Totality. 6. Every human being must respect the beliefs of others, keeping a critical but respectful dialogue in order to decipher the ultimate meaning of life. The following principles are a synthesis between the Tenth Noble Path taught by Siddhartha Gautama and the conventional Human Rights established by the UN, thus shaping an unprecedented Universal Declaration of Spiritual Rights created by the Maitriyana. The Buddhist Spirituality shows that any human being can reach the Path of Awakening as long as he is commited to ethical or appropriate practice, by overcoming psychical obstacles which implies being responsible for thoughts, attitudes and actions. However, society and governments must also establish a commitment to compliance with the Spiritual Rights as necessary conditions in order that all human beings achieve the Cure from suffering. These Spiritual Rights are the ingredients for the fulfillment of the Great Purpose of Maitriyana, by practicing a series of ethical or appropriate factors that have the potential to transform the inner and outer world by evaporating attachment, hatred and delusion. In fact, when these ten Spiritual Rights are practiced, the very evolution of humankind occurs through the Awakening. 1 - Right to Appropriate Understanding: Every human being has the Spiritual Right to freely develop thinking through an Appropriate Understanding about the origin of the life's suffering and how to achieve its the Cure, exercising the consciousness and righteous vision to go beyond the beliefs imposed by cultures, governments and religions. 2 - Right to Appropriate Attitude: Every human being has the Spiritual Right to be treated equally, recognizing his inherent dignity, so that the community should respect the individual through a righteous intention that evidences openness, renouncement and benevolence. 3 – Right to Appropriate Discourse: Every human being has the Spiritual Right to receive truthful discourses and useful information, valuing the Truth and honesty, so that the community should take care of the transmission of freedom of expression through the righteous word. 4 – Right to Appropriate Action: Every human being has the Spiritual Right to participate in the process of decision making that affect both his life and that of others, appreciating the importance of fraternity, direct democracy and popular self-determination, so the State must provide an opportunity of social relations lacking of violence, corruption, prostitution, concealment and drug trafficking. 5 – Right to Appropriate Lifestyle: Every human being has the Spiritual Right to develop his existential talent or vocation in company, having the civil right to have partner and children provided there is a commitment to the Good of the other, so the peoples must provide opportunities for growth to anyone who wants to contribute in leaving a legacy of righteousness for the future generations. 6 – Right to Appropriate Effort: Every human being has the Spiritual Right to access to work and rest, being rewarded for his persistence and determination in the right way of earning a living, so that society must allow the private property but simultaneously must redistribute income in pursuit of the benefit of the majority. 7 – Right to Appropriate Concentration: Every human being has the Spiritual Right to maintain his consciousness focused in a Purpose, by practicing a righteous meditation on the meaning of existence, so that the community has the obligation to contribute by providing educational means to achieve this end to all human beings. 8 – Right to Appropriate Attention: Every human being has the Spiritual Right to perceive the Real and live a life of peace by practicing an equanimous Mindfulness on the mind and then transfer it to the social and planetary level, so that society must vigorously avoid violence and simultaneously cultivate the necessary basis for psychic reconciliation, social justice, compassionate wisdom and ecological harmony. 9 – Right to Appropriate Knowledge: Every human being has the Spiritual right to have a righteous and detached knowing, by understanding Truth in the here and now, so the world must provide welfare and integrity to all beings after knowing the values of Liberty, Equality and Fraternity. 10 - Right to Appropriate Liberation: Every human being has the Spiritual Right to have a righteous Awakening, reaching self-realization and self-transcendence after appreciate the process of ethically dropping the attachments and aversions to objects and ideas, so humanity must tend towards Openness, Salvation and Evolution in order to survive and develop correctly.